Networx® top quality 25m OM5 Wideband Multimode Duplex Fiber Optic Patch Cable (50/125) - LC to LC, high-speed Multi-mode Optical Fiber cables will unleash the power of your Local Area Network. 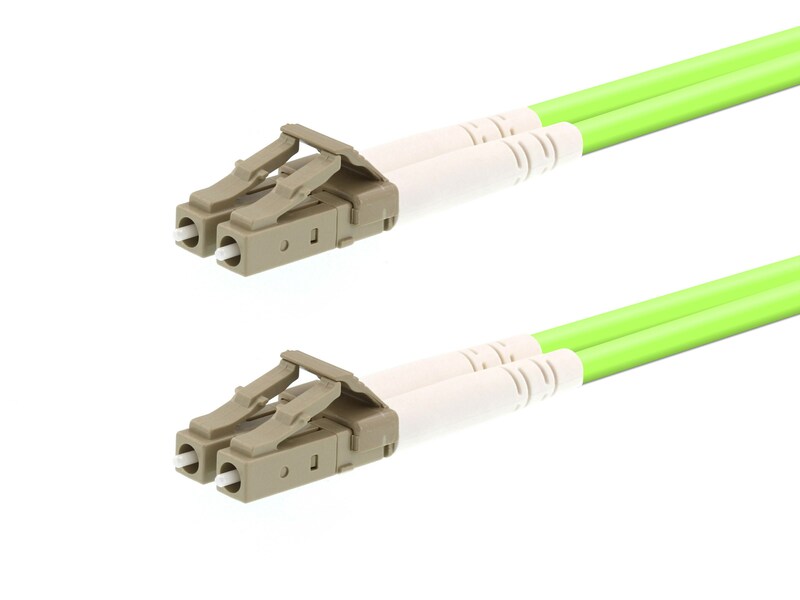 LC UPC to LC UPC OM5 100 gig Fiber Optic Cable, Multi-Mode Duplex, Lime Green Color, made with YOFC Fiber, 50/125 core size. Also known as Wide Band Multimode Fiber (WB MMF). The effective modal bandwidth for OM5 fiber is specified at lower and upper wavelengths of 4700 MHz/km at 850nm and 2470 MHz/km at 953nm. Fully compatible with OM3 & OM4 cabling. The OM5 optical and mechanical attributes are compliant with OM4 50/125 μm specifications and include the additional specifications of effective modal bandwidth and attenuation at 953 nm. WB MMF is intended for operation using vertical-cavity-surface-emitting-laser (VCSEL) transceivers across the 846 to 953 nm wavelength range. Parallel transmission is the default multimode fiber variant for data rates greater than or equal to 40G. Supports SWDM (shortwave wavelength division multiplexing) technology which can reduce fiber counts in optical transmission. OM5 cables can extend the reach from 100m with OM4 to 150m with OM5 with the same type of fiber optic transceivers. With ceramic ferrules and a 50/125 micron core, this cable is suitable for extremely high speed data transmissions such that you would find in 100 Gigabit Ethernet (100 Gb/s) networks. This 100 Gig fiber is OM5 Laser-Optimized. Each jumper cable is constructed of the finest components and shipped in individually sealed bags to ensure they arrive in perfect condition. Test results for the individual patch cable will be included in each bag. Color coded connectors assist with identification during the installation process to make installation easy for anyone.